This is a recipe for disaster…or is it? Harmony between children and dogs has everything to do with YOU! How many boundaries are you going to set (for both the child and the dog) and are you going to enforce them? How much effort are you going to put into the dog? How much effort are you going to put into the child? You must advocate for your child as well as your dog. Your child needs space and your dog must respect that, but your dog also needs space and your child must respect that. This is where a lot of the bites happen…dogs must give children space (and most everyone gets that), but dogs need space (most people don’t get that). Here’s the scenario: your dog is laying in the living room and your child goes up to the dog and starts cuddling it…the dog gets up and goes to lay in another spot (warning #1- I’ve had enough so I’m moving away). 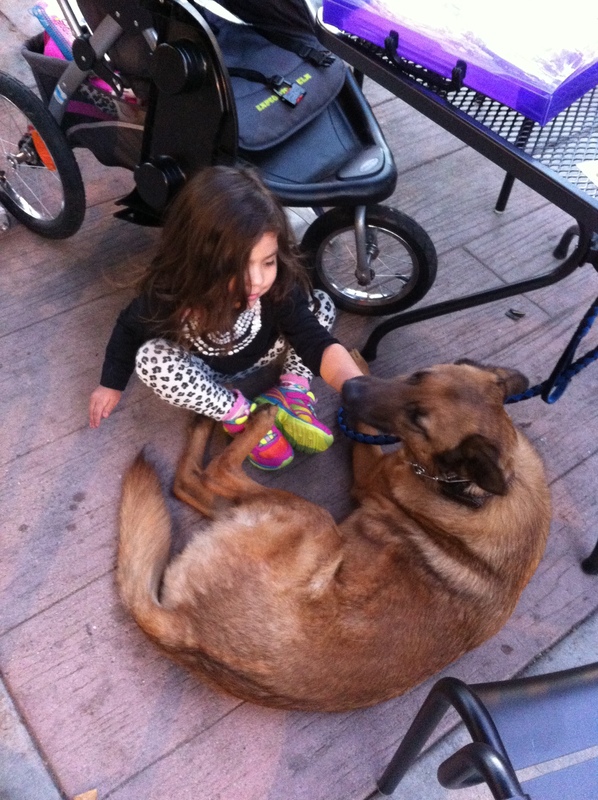 Then your child goes and starts grabbing it’s tail an the dog gives a little growl (warning #2 – I don’t like that). Then your child puts her face in the dogs face and the dog bites the child. No warning #3 just a bite. And this is where most people would put the dog down, but in actuality it was easy to prevent. Neither the dog nor the child can advocate for themselves so you have to do it. They can be brought up with a happy friendship if you simply put in place boundaries for both, and condition your dog and child, and NEVER leave them together unsupervised (no matter how much you trust your dog). *disclaimer: not all dogs will get along with children and not all children will get along with dogs, but they should be able to coexist.